The United States of America has been and will continue to be a lucrative country for immigrants for many years in the future. The high standards of living prevalent in this superpower as well as the professional opportunities provided in this developed economy attract millions of immigrants and refugees on an annual basis. Owing to limited resources, the US Body on Immigration enforces a cap of 675,000 people annually that can become permanent residents of the United States. There are various factors that determine how to apply for green cards in America through family based green card applications. Before we get into the nitty-gritty of family based green card applications, let us first look at the factors that determine the order of preference assigned to applicants for the green card. The first preference is given to those with close family members as permanent residents of the United States. Secondly, those with skills that can be harnessed to develop the US economy are absorbed into the American citizenry. Third come those applicants who live under questionable standard of living conditions and thus require refuge in the United States to rebuild their lives. Lastly, applicants from various ethnic groups are picked to promote diversity within the country. You can apply for the green card through various US governmental agencies and their factions that conduct their processes through respective embassies in the region. For the purpose of professional immigration, you have to go through official channels. Your employer has to apply for the lottery system of green card allotment along with provision of proof that they are willing to sponsor you. When it comes to family based green card applications, it is important to note that the same requirement of a sponsor holds good. What are the requirements for such a green card? 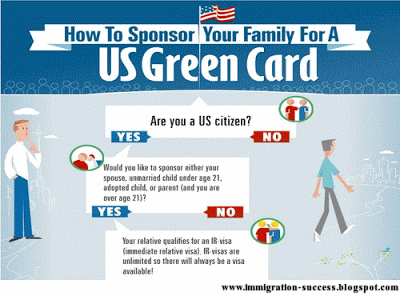 To procure a green card, it is necessary for your relative to be a permanent and lawful member of the United States. They have to be able to establish beyond doubt the close relationship ties they have with you as well as the legal documents that support the same. Along with this, your relative must be willing to sponsor you. This means that the relative must be able to prove that they have the resources to support you at 125% above the poverty line.